Greetings and Happy New Year. Lets start out with this tasty little number. I know little about the history of the drink so if you know, share it... dig? Stir with ice, strain and serve in a cocktail glass. Our initial reaction to the drink was complex flavors, but just too sweet. We added a dash or two of bitters and this balanced out the drink for us. We are not sweet drink fans, so if you like em toned down use the bitters. It made for a great aperitif, so one should do you well. *Maraschino is a clear, relatively dry liqueur made from Marasca cherries, including the crushed pits which give it a subtle bitter almond flavor. The cherries are processed and distilled much like brandy, and later combined with a pure cane syrup before it is aged and filtered. 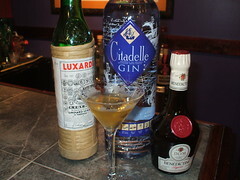 There are several distillers of this liqueur, but one of the foremost brands are produced by the Italian company Luxardo.